We lost our little Max this weekend. 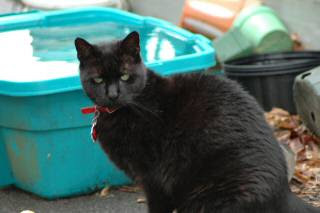 About 14 years ago a scrawny, young male cat with a gorgeous black coat, wandered into our yard. My first reaction was to ignore him, thinking he would soon return to his home. Max however had no intention of leaving. We had an old shed at that time, and he hid from the cold November weather by curling up on an old rug that we had stored in there. During the day he came out and sat at our back door. He had no intention of leaving. Eventually we let him in, much to the protest of our other cats. At night we put him in the cellar for the sake of peace and quiet. Max got to know this routine very well, and one night he hid just before bedtime. He was not going into the cellar! With the same remarkable determination, he made his way over to the place of honor on the couch. Max was here to stay! Though he was ill for sometime, he never complained. We gladly took care of him. I have lost many cats over my lifetime, and each time I think my heart could never break like this again, not until the next time. Animals teach us how to live and how to die. I am a better person for having known Max, but there is a hole in my heart that will never heal. I'm so sorry for your loss. I've been through the same heartache, but you're right, there is always a next time. Hugs. Oh I'm so sorry, Erica. It's so hard losing one's loved pet. Hugs to you. Awww, I am so sorry about Max. I know how much we all love our fur babies, and how much it hurts when they go to the Rainbow Bridge. Big hugs.